Spring road trip safety tips to help keep your vacation as safe as can be. The weather has warmed, and spring foliage is in bloom. It’s the perfect time to head out on a road trip. 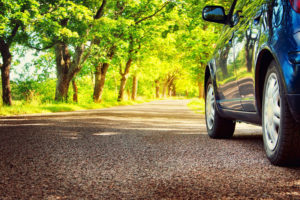 But, before you hit the road this spring, it’s important to be cautious. Find out what you need to know about staying safe on the road with these spring road trip tips. Before you set off on your road trip, it’s important that you’re well prepared. Research your route and plan your trip accordingly. That way you know where you’re going. Plus, you can make the necessary reservations, and you can bring maps to help you navigate your new surroundings. When roadside emergencies occur, it’s important that you’re prepared with the right supplies. Keep an emergency kit in your car so that you can handle whatever the road throws your way. Keep a first aid kit, blankets, food and water, flashlights, jumper cables, emergency flares, tire gauge, and anything else you think you may need in the car so that you’re equipped for an emergency. After the winter weather, potholes are a common occurrence. Potholes can cause serious damage to your tires and ruin your car’s alignment. Additionally, spring brings new life, including new wildlife. Be on the lookout for animals crossing the road. Watch out for these road hazards so that your spring road trip goes off without a hitch. Stay safe on the road this spring with these road trip tips. For added safety, ensure that you invest in the right auto insurance. Contact the professionals at Robert J. Los Insurance Agency to find you the right insurance plan. Located in Hamburg, New York, we serve all your personal and commercial insurance needs.